CD review: "The Complete Blue Note Sixties Sessions"
Remembered primarily for his late-in-life starring role in the modern film noir classic "Round Midnight," the late tenor saxophonist Dexter Gordon was the pre-eminent romanticist of his generation. Unfortunately for him from a marketing point of view, his generation was immersed in hard bop, fusion and avant-garde, while he was taking the stylistic baton from Lester Young and running with it. Thus, Gordon was never given the same adulation as Charlie Parker, John Coltrane or Sonny Rollins. Perhaps this six-disc collection detailing his '60s recordings for Blue Note will help rectify that. As this collection shows, Gordon not only had one of the warmest tones ever on tenor sax, but he played with a combination of grace and passion that place him alongside the greatest jazz artists of all time. And the setting on these Blue Note sessions was the best the jazz world had to offer. 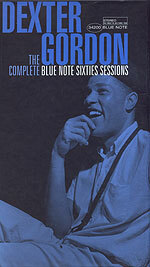 The label surrounded Gordon with players of the highest caliber, such as pianists Kenny Drew and Bud Powell, trumpeters Freddie Hubbard and Donald Byrd, drummer Billy Higgins, bassist Niels-Henning Orsted Pedersen, and Bobby Hutcherson on vibes for some sets. In this rarified jazz atmosphere, Gordon thrived and set down some of the most melodic jazz to come out of the bop era. This was no easy listening; Gordon was of the bop generation and his music could drive hard. But he always, always had that smooth tone.